Ophelia begins with a length of beautiful lace edging. When the edging is the desired length then the body of the shawl begins by working on the straight edge of the edging. Decreases are made at the beginning, center and end of every other row until the center stitches are joined together. The work keeps going faster and faster as it progresses as the number of stitches keeps decreasing. 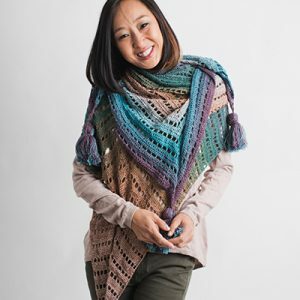 Maya is a quadrilateral shawl perfect for layering in a variety of ways. The tassels in each corner add weight to the airy Boho feel. 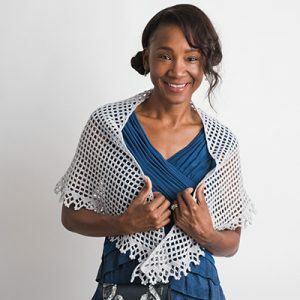 Using all four of the common crochet stitches— single crochet, half double crochet, double crochet, and chain stitches — this is the perfect shawl for new crocheters to try. 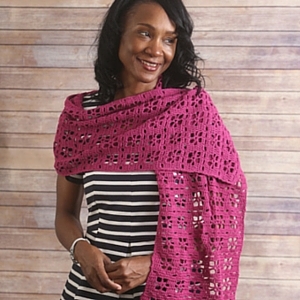 Madelyn is a half circle shawl that can be dressed up or down for warmer days. 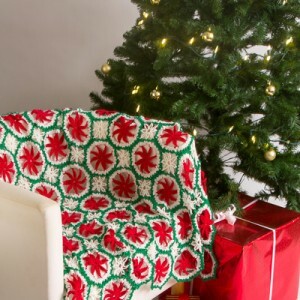 This lightweight design is done in a granny style pattern intermittent with rows of Solomon Knot. Finished with an edging of Solomon Knots and picots, Madelyn is an intermediate design you’ll be proud to crochet. This delicate shawlette design made with soft cotton yarn is inspired by traditional filet crochet technique. 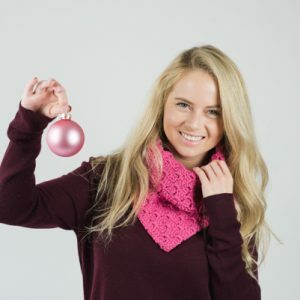 A lacy pattern with a stylish flower motif is easy to make with only three stitches needed: chain stitch, slip stitch and double crochet. The fringe gives this shawlette an extra boho look. A thing for every place, and a place for everything! This is a pajama case that can be hung from a bedpost, chair, closet door — you name it. 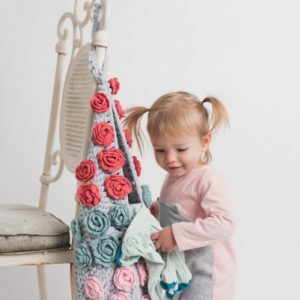 Crocheted in a super soft yarn and covered in roses, cleaning up will be fun for your little one. Have them put their pajamas in the case first thing in the morning and pretty soon they’ll be tidying their room (we wish!). It’s definitely hip to be square — just take a look at this vest. 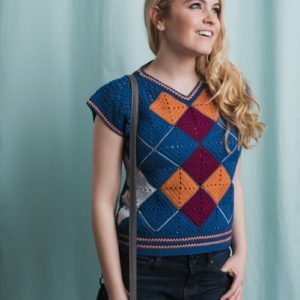 Constructed with two types of granny squares for maximum visual appeal, each argyle is oversized giving this traditional top a new look that’s perfect for the season. Need a lightweight, stylish tank to wear to your next coffee shop visit? This simple top is just what your hooks have been asking for. 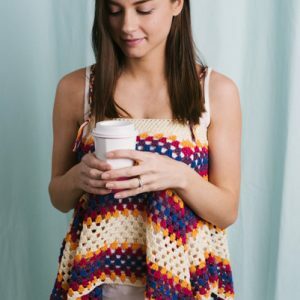 Made with an easy single crochet band at the top and granny squares near the bottom, the result is a breezy tank with a flowing look and feel.